In addition to the development of large-scale solar projects and rooftop solar power systems on its rail stations, Indian Railways is now planning to install solar panels on top of its trains. Indian Railways will install flexible solar panels and batteries to power lights and fans on board of 250 of the network’s trains. The Council on Energy, Environment and Water (CEEW) found that Indian Railways could install as much as 3,900 megawatts (MW) of utility-scale projects and 1,100 MW of rooftop projects through an investment of approximately $3.6 billion. Video starts at 1:00 !!! The next time you travel by train your coach is likely to be powered by the Solar Panels for supplying power to the Lights, fans, Air Conditioners , charging points etc. Indian Railways is planning to come out with a solar policy for procuring 1000 MW solar power in the next five years. The clear motive of the project is to cut down on the Railways Electricity & fuel bill, which is the second-largest component of expenditure after the employee salaries for the cash-strapped government. The Integral Coach Factory, in collaboration with the Divecha Centre for Climate Change at the Indian Institute of Science from Bangalore have been conducting trial run of solar panels installed atop a special Linke Hofmann Busch (LHB) Prototype coach .The special sleeper class LHB coach fitted with two flexible solar panels of 180 Watt each, matching the exact curved shape of the coach’es rooftops, at the ICF. Researcher’s M Shravanth Vasisht and Vashishta Ademane have been travelling on board with the equipment to record the real-time data of solar power generated every minute. The first DEMU Train with prototype solar based hotel load system has been commissioned in cooperation with ICF, Chennai. This first rake has been based at Shakur Basti DEMU shed of Northern Railway. Twenty four more coaches will be fitted with this system at Shakur Basti within next 6 months after completing the field trials of the first rake. Solar hotel load system fitted on each coach is of 4.5 KW capacity consisting of 16 Solar Panels of 300 Wp each. The system is capable of developing up to 20 kWh per day (average) through out the year . Surplus power generated during peak hours is stored in a 120 AH battery system. The system uses a data acquisition system and interfaces with existing hotel load power system of DEMU train. It will help in generating useful data for research for adapting the system for future rollout on all trains of IR. The system costs about Rs. 9 lakhs per coach at prototype stage . Normally, DEMU trains provide power for its passenger comfort systems from a diesel driven generator fitted on its Driving Power Car (DPC). IROAF has developed this system with a smart MPPT invertor which optimises power generation on a moving train to cater to full load even during the night. The system helps in reducing Diesel consumption of the DPC and hence reduces carbon signature of these commuter trains by reducing CO2 generation by 9 Tonnes per coach per year. A solar power DEMU train with six trailer coaches will save about 21,000 Litres of Diesel and thereby bring cost saving of Rs.12 lac every year. Savings for a 10 coach rake with 8 trailer coaches will increase proportionately. These benefits will continue for entire 25 years life time of the rake. This will help in making DEMU commuter services better and more economical. India launched its first solar-powered local train at the Safdarjung railway station. The DEMU (diesel electric multiple unit) train is entirely powered by the solar panels that are installed on the roof of the train, including the energy needs of the coaches – lights, fans, information display system. The train is equipped with a battery bank which ensures enough power for it to run even without sunlight thanks to a smart inverter which optimises power generation on a moving train. The train was manufactured at the Integral Coach Factory (ICF) in Chennai, and the solar panels by the Indian Railways Organization of Alternative Fuel (IROAF). According to the Railways, one solar-powered DEMU train with six trailer coaches enables a saving of 21,000 litres of diesel. The first DEMU Train with prototype solar based hotel load system has been commissioned in cooperation with ICF, Chennai. Solar hotel load system fitted on each coach is of4.5 KWp capacity consisting of 16 Solar Panels of 300 Wp each. The system is capable of developing up to 20 kWh per day (average) through out the year . Surplus power generated during peak hours is stored in a 120 AH battery system. The system uses a data acquisition system and interfaces with existing hotel load power system of DEMU train. It will help in generating useful data for research for adapting the system for future roll out on all trains of IR. The system costs about Rs. 9 lakhs per coach at prototype stage . ABB India is partnering with Azure Power to provide solar inverters to 750 railway stations in north India to reduce dependence on traditional sources of energy, it has been revealed. 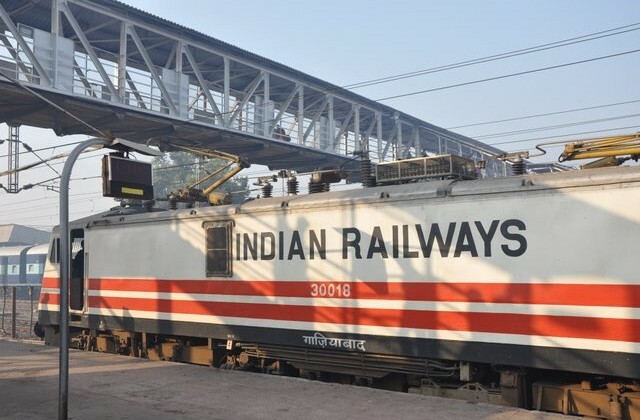 Indian Railways, which runs one of the largest railway networks in the world, carries more than 8bn passengers annually, with the 750 stations where inverters are to be installed located in the busy northern Indian part of the network, one of the most used railway corridors in the world. The organisation recently reached a milestone of 5GW of solar inverters installed, supplying some 40% of India’s solar power at approximately 13GW. ABB solar inverters for this project will vary between 5kW to 50kW in performance depending on the size of the station, and will be part of the solar installations being set up by Azure Power. Nagpur Metro will set up solar power projects in a phased manner to meet at least 65% of its power demand. Delhi Metro Rail Corporation has signed power purchase agreements to buy more than 200 megawatts from a solar power project located 800 kilometers away. DMRC has also set up several rooftop solar power projects and targets 50 megawatts from this segment by 2020. Mumbai Metro, Kochi Metro and Chennai Metro have all announced plans to set up rooftop solar power projects. Indian Railways will soon launch tenders to set up large-scale solar power projects working towards its overall solar power target of 5 gigawatts. Railway Minister Piyush Goyal recently announced that Indian Railways will soon float solar power tenders to set up 3 gigawatts of capacity. These projects will be set up over the unused surplus land that the Railways owns. The Indian Railways is planning to set up a 1 gigawatt solar power park in the state of Madhya Pradesh. The Railways was attracted to the state as it hosts the Rewa solar power park.